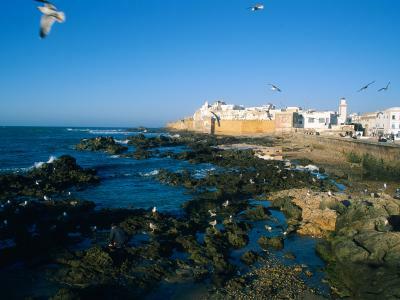 Along the Atlantic coast lies Essaouira. Since the 1500's, it went by its portuguess name Mogador or Mogadore. Essaouira a calm harbor protected by a natural bay partially shielded from wave action by the Iles Purpuraires. South of Essaouira lays a sandy beach at which point the Oued Ksob discharges to the ocean. Further south, you'll find the archaeological ruin of Bordj El Berod. Essaouira connects to Safi to the north and to Agadir to the south via the N1 road and to Marrakech to the east via the R 207 road. There is a small airport not too far from town, which has flights to Paris-Orly several times a week and daily to Casablanca. The Medina here is home to many small arts and crafts. Cabinet making and wood carving have been practiced for centuries in this area. 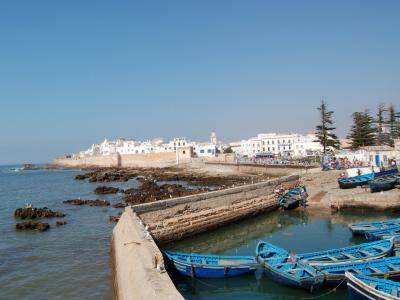 With strong ocean winds blowing almost constantly, Essaouira is also known for kite surfing and windsurfing. Parasols are often used on the beach to shield against the wind and blowing sand. 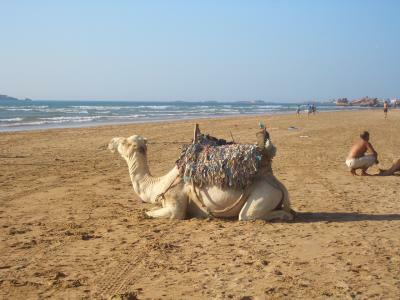 Camel, bike, and photographic excursions from the beach and into the desert are available.